According to data released by TRAI about telecom subscriber base in India at the end of July 2016, Wireline subscriber base declined from 24.74 million at the end of June 16 to 24.62 million at the end of July 16. Net reduction in the wireline subscriber base was 0.13 million at the monthly decline rate of 0.51%. The share of urban and rural subscribers in total wireline subscribers were 83.74% and 16.26% respectively at the end of July 16. The Overall Wireline Tele density declined from 1.94 in June 16 to 1.93 in July 16, with Urban Wireline Tele density and Rural Wireline Tele density being 5.17 and 0.46 respectively. BSNL and MTNL, the two PSU access service providers, held 71.18% of the wireline market share. 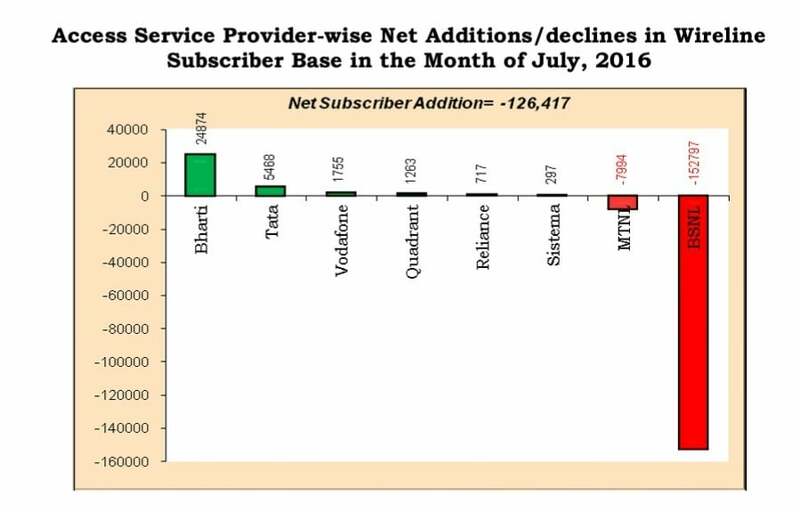 Interestingly in stark contrast to BSNL adding the highest number of new wireless subscribers in July 2016, the same operator has also lost the highest number of wireline subscribers in the same month. The graphical representations of access service provider-wise net additions in wireline subscriber bases in the month of July 16 are given below. Bharti Airtel added the highest number of new wireline subscribers (24,874) followed by Tata (5468), Vodafone (1755), Quadrant (1263) and Reliance Communications (717) and Sistema (297). Operators which suffered a net loss of wireline subscribers include BSNL which lost the most number of subscribers (1,52,797) followed by another state run operator MTNL (7994). As per the report, the number of broadband subscribers increased from 159.80 million at the end of Jun 16 to 166.96 million at the end of Jul 16 with a monthly growth rate of 4.48%. 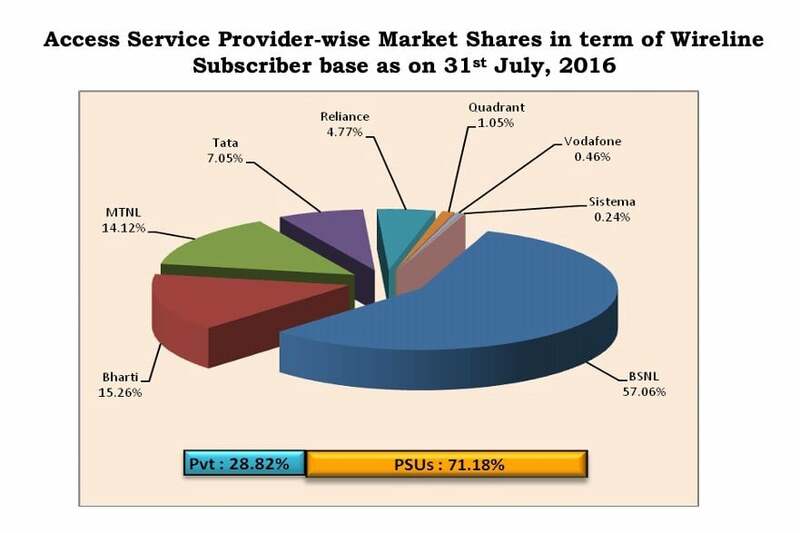 Top five service providers constituted 84.83% market share of the total broadband subscribers at the end of Jun-16. These service providers were Bharti Airtel (44.41 million), Vodafone (33.36 million), Idea Cellular (28.19 million), BSNL (20.92 million) and Reliance Communications Group (14.74 million). 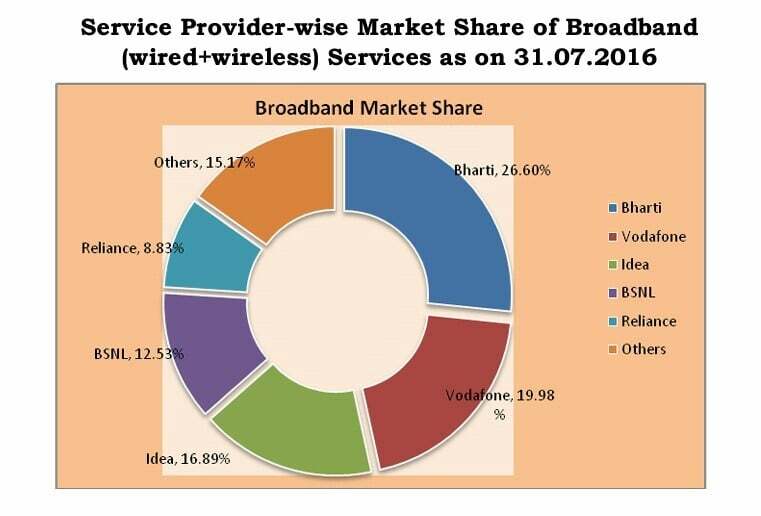 While in wired broadband segment, five leading wired broadband service providers were BSNL (9.86 million), Bharti Airtel (1.88 million), MTNL (1.08 million), Atria Convergence Technologies (1.05 million) and YOU Broadband (0.57 million). Report: Vodafone 4G faster than Reliance Jio? The main reason of reduction of subscribers for broadband is attributed to not so satisfactory services. Moreover, there are instances of going out the broadband connected handphone line frequent due to some or other reason, which the customers can ill afford to wait for restoration.